"After always having a love for animals, especially dogs, I decided to chase a career as a dog groomer." I did lots of research on possible courses because I wanted to get the best possible start, considering I had never groomed a dog before, or worked in the industry. I went and spoke to groomers in my area, and majority of the ones who took time to speak to me mentioned the name 'Kylie Tatti'. One salon owner, and groomer, (now my boss) told me to look into Kylie Tatti's Dog and Cat Grooming Academy. At the time it wasn't open yet, but it was only a matter of weeks until the first Cert III course would start. I was happy to wait, considering how highly regarded Kylie is in the industry, and how highly other groomers spoke of her. 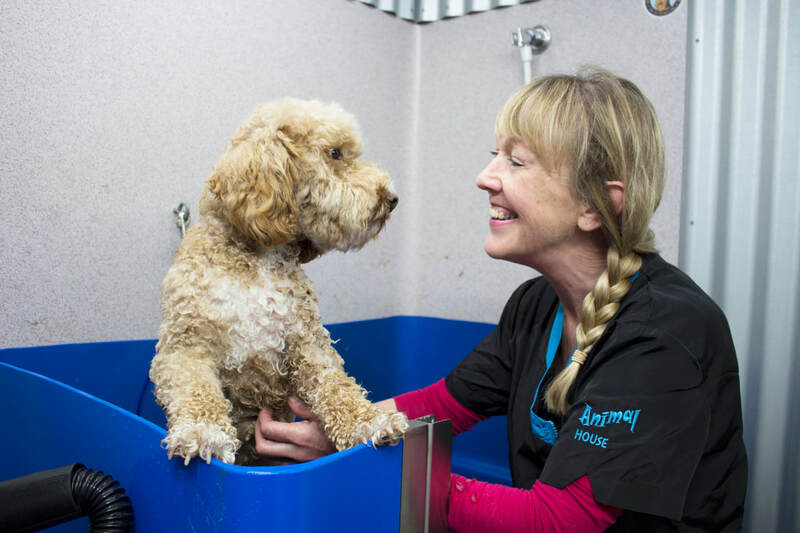 I completed my Cert III in Pet Grooming with Kylie at KT's Academy in September last year and I couldn't be happier with the course I did, the academies facilities, or the head start I was given in my grooming career. I really do feel like I did the best course in the industry, and in just 4 weeks I had confidence and knowledge I never thought I would gain from such a short course. My current boss was a groomer that highly recommended Kylie's course, and even she was impressed how much I had learnt and the head start the course gave me, not just with grooming, but also handling and general knowledge of equipment and processes. I have now been working in a dog grooming salon for 8 months, and while I am still always learning, I use and think about things Kylie and her course taught me everyday. The course at KT's gives you so much hands on learning, as well as Kylie's wealth of knowledge, which she loves to share with her students. I can't recommend Kylie and her course highly enough to anyone wanting to get into the industry! Well four years down the track and I am living the dream owning and running my own business. In my first year I slowly built a clientele using flyers to begin with and then utilised the fantastic strengths of facebook advertising. By the end of my second year my part time business was full time. By the end of my third year, my client base is full. A decision to grow my business further and employ others is definitely a possible choice, but for me I love where I'm at. The bond between a groomer and the regular clientele dogs is wonderful. The trust that these dogs develop with a groomer is so special. Always still learning on the job and attending seminars when I can, but the skills I acquired learning from Kylie Tatti have been unsurpassable and always the basis to any groom I complete. "Completing my studies at KT's Dog and Cat Grooming Academy was only the beginning for me and I have no hesitation in turning to them for continued advice and support through out my journey." From the initial contact I received nothing but professionalism, outstanding training and gentle, caring guidance and support. Detailed course information, a state of the art training facility, quality products and equipment and assistance with accommodation, touch on some of the reasons why I would recommend KT's Dog and Cat Grooming Academy. I had the priviledge of being one of the first students of the Academy and it was very much still a work in progress. It was very exciting to see the future potential and be a part of this family environment where our ideas were also warmly welcomed, futher enriching our experience. The small group size at the Academy enabled an intimate nurturing of like minded people, where support, advice and care were evident in things like assignments, grooming, business ideas, emotional support and most of all friendship. In 2017 I was in search of a career change that was conduisive to not only my family but my own personal growth, development and job satisfaction. 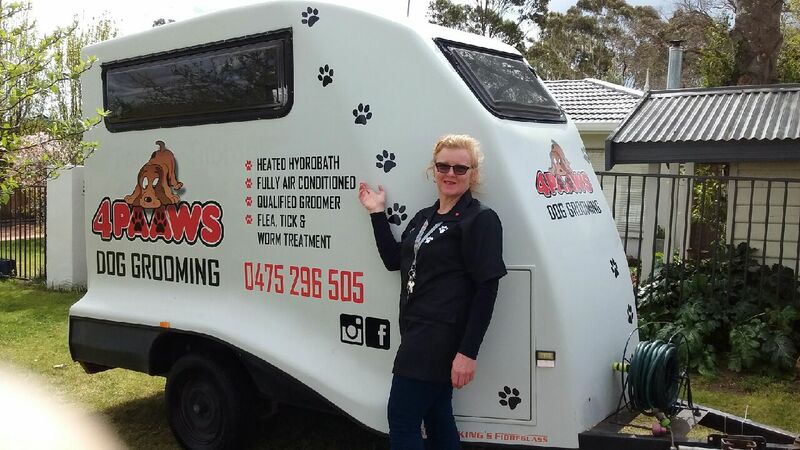 My love for dogs, small business, business ownership and a genuine desire to help others, along with my observation that there was a real need within my local community for a mobile dog groomer, all steered me towards KT's Dog and Cat Grooming Academy. My business is actively involved within the Community, including educating school children regarding care of their dogs, Animal Aid fundraisers and invitations to talk with Animal Studies students at Federation University. As part of my Holistic Care I am considering starting a "doggy bank" which would enable dogs to be placed with foster carers or long term homes should the owners be unable to care for the dog in times of illness, circumstance, death etc. Within the first 12months I was focusing on future expansion on several levels including mobile and salon. Completing my studies at KT's Dog and Cat Grooming Academy was only the beginning for me and I have no hesitation in turning to them for contiued advice and support throughtout my journey. Couldn’t recommend KT’s Academy highly enough. Kylie is a fantastic teacher who genuinely loves to empart her vast grooming skills and knowledge to you. Since completing my Cert III in Dog grooming with KT’s I have set up my own successful grooming salon from home. The practical aspect, working with dogs every day really does prepare you for a career in the grooming industry. An added bonus has been the friendships that I made while completing the course.